Warwickshire have agreed new long-term contracts with batsman Sam Hain and pace bowler Boyd Rankin. Hong Kong-born Hain, 19, has signed a new four-year deal after hitting four Championship hundreds this summer. Rankin, 30, who switched allegiance to England in 2012 after starting his international career with Ireland, has agreed terms for a further three years. "Both made important contributions to our success in 2014," said Bears director of cricket Dougie Brown. Rankin, who signed from Derbyshire ahead of the 2008 season, helped the Bears win the CB 40 in 2010, the County Championship in 2012 and the T20 Blast in August. He made his England Test debut in 2013, having previously represented Ireland in two World Cups and three World T20s. 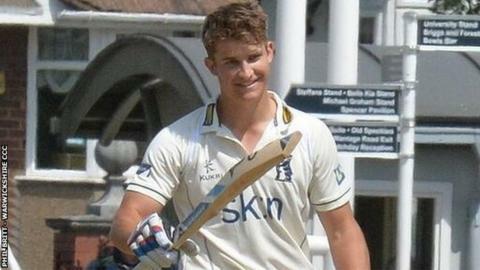 Hain became the youngest Warwickshire player to score a double hundred this summer, aged 19 years and 57 days, having earlier this season broken Ian Bell's record to become the youngest in Bears' history to score a first-class century. "They will be key for our push for more silverware in 2015 and beyond." Warwickshire played well in all three formats of the game in 2014, winning the T20 Blast as Birmingham Bears, reaching the final of the One-Day Cup and finishing as runners-up to Yorkshire in the Championship. Hain, who was brought up in Australia, scored 823 Championship runs, at an average of 51.44, while Rankin took 49 wickets in all competitions. "Boyd's pace and bounce make him one of the most feared bowlers on the county circuit. At his best, he is a match for any batsman in the world," continued Brown. "His form in the latter part of the season was key to our qualification for the One-Day Cup final at Lord's and claiming our first T20 Blast title at Edgbaston. "Sam took his opportunity in first-class cricket last season and is now one of the most exciting prospects in the country. His record-breaking feats have rightly attracted a lot of attention and we are thrilled that he has committed long-term to Warwickshire."